Four years after his directorial debut with the indie hit Submarine, U.K. comedian turned filmmaker Richard Ayoade is fast becoming one to watch in independent filmmaking. He now takes his second directorial turn with The Double. While Submarine was a whimsical tale of adolescence, Ayoade’s semi-modern adaptation of Fyodor Dostoevsky’s novella The Double is a sardonic take on mistaken identity. The movie follows a shy clerk for a government agency named Simon James (Jesse Eisenberg) who falls in love with a cute girl at the agency, Hannah (Mia Wasikowska). No one pays attention to Simon. They even forget he exists. But not Hannah. After Simon and Hannah go on a date, a new employee is hired who looks exactly like Simon. He goes by the name James Simon (also played by Eisenberg) and is the complete opposite of Simon personality-wise. James takes it upon himself to help Simon with his social struggles. Wallace Shawn, Yasmin Paige and Cathy Moriarty are a few of the famous co-stars. Eisenberg and Wasikowska actually began an off-screen relationship soon after filming The Double. On-screen they both appear to be comfortable and confident together. Eisenberg successfully plays both awkward and cocky as the two personas he juggles throughout the 90-minute runtime. Wasikowska continues her indie reign with already her third acclaimed film this year. 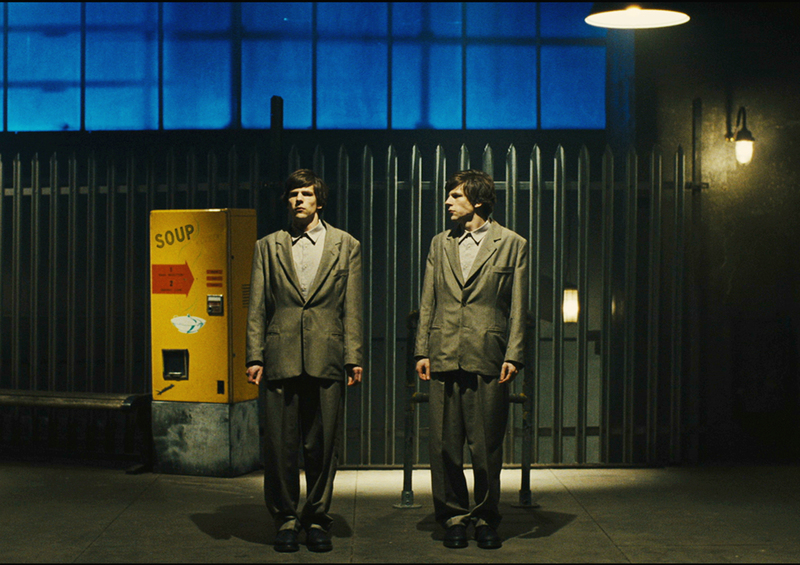 The Double might not be as audience friendly as Ayoade’s last, with darker ambiguous themes and direction, but it is still worth a viewing for artsy film fans.